Left to right: Urban Outfitters dress (borrowed from sister); A Pea in the Pod stretch lace maternity top (new), Old Navy maternity capri jeans (resale); American Apparel turtleneck dress (old), Ingrid and Isabel belly leggings (new). Let me start out by saying that many other mama bloggers have said it before and I'll say it again. Most maternity clothing out there is a combination of unflattering, unfashionable and low-quality ick. The good stuff that is out there is EXPENSIVE. I mean really expensive. During my pregnancy, I wanted to feel good and look cute, but I have always been a thrifty kind of girl, so I found myself in a bit of a dilemma. I know women have spent between $50 and $1000 on their entire maternity wardrobe. Of course you must factor in women who score $1 clothes from craigslist, have lots of sisters and friends with hand-me-downs, and those who work in offices and need work attire. My goal during the 3rd trimester was to simply shop smart. I can't really get away with only spending $50 (especially since I made it a priority to buy well fitting bras and flattering jeans), but I think it's OK to spend more when I know the clothes will see some life after this pregnancy. 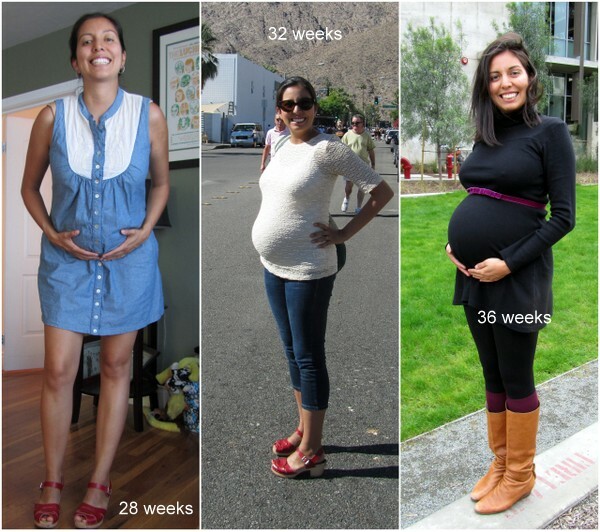 Since I was able to wear mostly non-maternity clothes throughout the first two trimesters, any maternity clothing I purchased during the last trimester would really only get three months of wear (plus some time post-partum, e.g. my jeans, and hopefully more wear later with future pregnancies). I just couldn't justify paying higher prices for items I'd only wear a few months. What's a budget-minded girl to do? 1. Hit your local baby resale and consignment boutiques, which usually have a small maternity section. (San Diego Children's Resale Shop resource coming soon...) I ended up getting gently used maternity tanks for $2 each, nursing tanks for $6 each, and a few tops for between $5-10 each. I didn't have very good luck finding anything at online resale shops, but this one has a decent selection. ***NOTE: I also found a pair of belly leggings for $6 that are much softer than the pair I mentioned in this post. I've already had to patch up the more expensive pair of leggings after only 3 months of use. I thought by spending more I'd only need one good pair of leggings. Baloney! If I could do it all over again, I'd only buy leggings from resale shops or anywhere that charges less than $10. 3. Get a good pair of jeans on SALE. I didn't have any luck with jeans at the resale shops (the designer pairs that fit in the waist were hemmed too short; the rest were just UGLY), so I went to A Pea in the Pod. I didn't want to have to bother with online shopping because I wanted something that fit NOW, so off to the over-priced shop I went. They do have some lovely items, but those prices! Anyway, I tried on a pair of cute Citizens of Humanity ankle skinny jeans, but for $150 on sale, I just.couldn't.do.it. I ended up buying the store's own brand of denim for $25 off the original $90 price tag. Still, not my favorite price to pay, but I only bought one pair of jeans, so there you have it. 4. Check for sales, specials and promotions at online shops like duematernity, figure8 and tummystyle. Japanese Weekend also seemed to have some great deals in their sale and clearance sections (limited sizes, of course). Sign up for GILT, which often features designer maternity clothes at a discount. Example: I got two maternity/nursing tops from tummystyle with a 30% off coupon code for Maternal America, so they cost around $35 each. Not great, but much better than original prices ($72 and $66 each). 5. Search for your favorite brands on ebay. In addition to other brands I mentioned, I saw nice styles with brands like Olian, Majamas, and Larrivo. Here is my maternity wardrobe post from the 2nd trimester. Oh, that is a scary number! Don't forget I made some "splurges" (the nursing tops and bras and new jeans). BUT, I remind myself that I will wear some of these purchases throughout nursing and use it all over again for future pregnancies. Plus, I could always pass them along to my sister and sell the rest to consignment shops when I'm all through with baby-making! The funny thing is, despite all the money I spent, in the first and third photos above I am wearing non-maternity clothing (except for belly leggings). It seems the maternity/nursing clothes I did purchase are not all that photo-worthy. Fail! You look so cute in the your 3rd trimester! I was a total monster, so big I could hardly move! Thanks! It's all because I had a small baby in there (6 lbs. 10 oz. at birth). I wouldn't have minded being a bit bigger if it meant I'd have a bigger baby because I hear bigger babies sleep better at night!! My little guy wants to eat every 2 hours!! You look so cute, Amanda! I'm totally inspired by how thrifty you've been. I know it must seem like a big number for clothes for 3-9 months, but I think it is important to keep feeling beautiful (inside and out) while you're pregnant. At least, I think so ;) Having never been pregnant I feel I can't really give my two cents yet. Regardless -- way too go!!! Thanks, Lar. I agree... it's very important to feel good while pregnant! Love to see you around! I am doing a giveaway right now for a Lisa Leonard Designs "Inspire" necklace. Its about spreading kindness and positivity! Stop on by! Thanks! Your boys are adorable!